Your sitting is the most important part of the process. You want to be relaxed and comfortable. We can stage it in your home or your favorite locations. I also have a list of several amazing locations you will love. Where ever we decide to shoot, you can be confident that it will be fun, creative and result in amazing photographs. Ordering your prints is very easy. You can buy individual prints or one our packages. I have put together some nice packages with the most use full sizes including a sharing package which consists of all smaller prints, perfect for handing out to friends and family. All packages are mix and match so you can get just the prints you want without spending a lot of money. To order your prints, just click on the images you want and add to cart. Then select the prints and packages you want. CD Has edited photos and the rest of the un-edited photos from the shoot. Photos are edited to my printer specifications so I cannot guarantee your results. Each CD will contain about 100-120 photos and 20-25 edited photos. Your wedding is your most special day. Because of that, our weddings are priced al-la-carte to cater to your needs. We will sit down with you and work out a package that fits into your budget. We can shoot everything from a traditional wedding format to creative and wild. Location shoots, trash the dress shoots, what ever you want. All your photographs will be posted in your own private gallery so you and your family and friends can order just the prints they want at a reasonable price and all prints are shipped directly to them. (and you). We can do anything you want from bound albums and canvas wraps to prints, mugs and gift items. The sky's the limit. What better way to document your senior year, your wedding day or your special event than with a beautiful bound album. 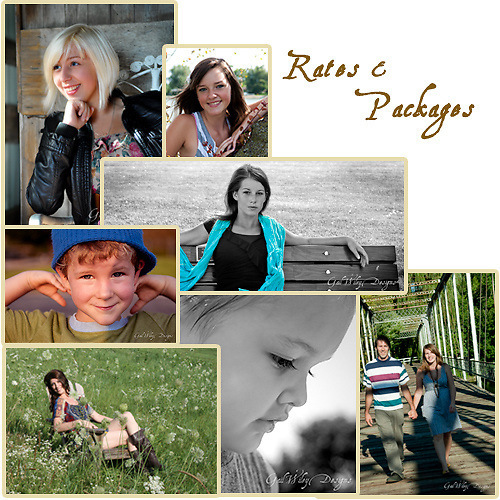 These albums are specially designed for you using the photos you pick and created especially for you. You will be sent a final proof before going to the printers to make sure it has all the special touches you deserve. Below are some of the sizes we offer. If you don't see what you want, feel free to ask. I am happy to work with you.